I really fancied a different risotto this week and this one really hit the spot. It’s a lovely big bowl of goodness and really filling too. 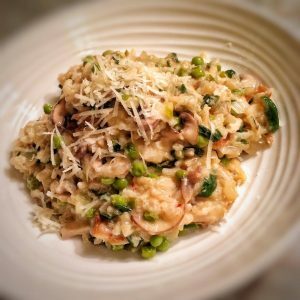 Sometimes risotto can be a bit time consuming to prepare but as you don’t have to actually cook any meat, this recipe is speedy and fuss free! In a large saucepan fry the onion in 1kal until nice and soft (6-7 minutes). Add the garlic and fry for a few more minutes. Add the rice and wine, stir and simmer for a minute or two and then add half of the vegetable stock and leave to simmer for around 15 minutes adding a little stock at a time when the rice starts absorb the stock. Stir regularly to ensure the rice doesn’t stick to the bottom of the pan. Next, add the spring onions, spinach and peas, cook for a further five minutes, again adding a little stock at a time until it is all used up (I used all of it but it varies depending on the heat of your hob). Next flake in the mackerel, give a good stir and cook for a further five minutes (or until the rice is cooked). Remove from the heat, add the parmesan and a good squeeze of lemon, season to taste and give another stir. Serve piled high in a nice bowl and enjoy!! Skinny Kitchen Secrets and the UK Blog Awards….click HERE to vote for my blog!! wow! this is a super recipe! perfect for a cold winter’s night 🙂 Portion size was perfect for me, perhaps a little bit small for hubby. Lovely fresh taste thanks to the peas and spring onion. Very easy to make also, thanks Laura! !